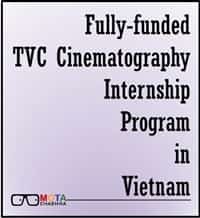 UNESCO Centre of Cinema Development (UCCD) in collaboration with Tuvan Media invites applications for Fully-funded TVC Cinematography Internship Program in Vietnam. The TVC Cinematography Internship Program is open for Undergraduate and recent graduates related to the field of Film and Television Direction, Cinematography. The selected candidates will not be paid any salary but will be provided with accommodation, flight tickets, living expenses in order to support their stay in Vietnam. The candidates are will be staying in Vietnam for a period of 3 to 6 months starting from January 15, 2016 functioning as a Director/ Director of Photography. The online applications are to be made via email and candidate should attach Resume & Cover Letter to apply for the internship. The last date to apply for the scholarship is November 01, 2015 and the result will be made available on November 25, 2015. Nationality: No Restriction related to nationality has been mentioned by the Organizers. Academic Qualification: Undergraduate student or recent graduate from Academies of Theatre and Cinema, Universities of Film Theatre or all Schools with related training courses with prominent study results. Experience: The candidate needs to have at least 2-3 videos or short films. Language: The applicant must have excellent communication skills in English. Duration of Program: Theprogramwill start from January 15, 2016 and will continue from 3 to 6 months. Travel & Visa Expenses: The intern will be paid with round trip flights for their travel along with expenditure on Visa. Accommodation:Accommodation to the interns will be arranged by the organizers. The selected candidates will work full time and take part in TVC projects in the position of Director/ Director of Photography in Vietnam. The interns will build portfolio and strengthen credentials while broadening their network of professional contacts in Film industry. Improve adapting ability and flexibility along with gaining working experience and enhancing professional skills in an international environment, enrich knowledge and solve problems in an effective manner. Receive Certificate after Project completion. Applicants should also provide link of their prominent films in which he/she has participated in term of directors/cameramen. The list of the candidates selected for the interview will be notified by November 10, 2015. The Final result of the selected candidates will be made available by November 15, 2015.